Go to Apparel Showroom, online at ApparelShowroom.com, for great discounted wholesale clothing. Apparel Showroom offers tons of styles for juniors, misses, and plus sizes, including the latest trends in pants, leggings, denim, rompers, shorts, dresses, maxi dresses, intimates, shoes, jewelry, swimsuits, and other accessories. Apparel Showroom also offers a selection of fashion for men and kids. ApparelShowroom.com can offer great prices by taking overstocks and large quantities from manufacturers and importers from the Los Angeles area. So enjoy top fashion at affordable prices, but before you shop, be sure to get all the latest ApparelShowroom.com discounts, Apparel Showroom promotions, and Apparel Showroom coupon codes, found here at RetailSteal.com. Apparel Showroom ships in the United States and internationally. Consult site for further delivery and payment options. Use our exclusive RetailSteal coupon code for 15% off your purchase over from ApparelShowroom.com. Use code on orders of $1000+ to qualify. Use this coupon code at Apparel Showroom to take an extra 10% off your order. Click link to save even more on great wholesale clothing! Shop online at ApparelShowroom.com and enjoy a 15% discount on your order. Use coupon code on orders of $1,000 or more for your discount. Enjoy an extra 10% savings when you shop whole sale at Apparel Showroom. Enter our coupon code at checkout to receive this discount. 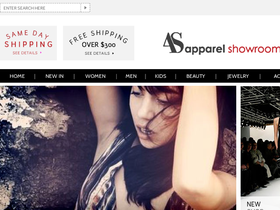 Save 40% on sale items from Apparel Showroom when you use this coupon code online. Click to save. Save an extra 10% at ApparelShowroom.com. Click here to shop and use coupon code to save. Enjoy free US shipping on purchases over $300 at ApparelShowroom.com. Click here to shop. Save up to 80% off wholesale prices at Apparel Showroom. Click link to save on clothes, shoes, jewelry, and accessories. Shop the sale at Apparel Showroom and save an extra 50% on select apparel. Click link to check out the styles. Save $10 on your entire order from Apparel Showroom when you use this coupon code online. Use code on orders of $100+ to qualify.